Join us for our monthly real estate appraiser meeting (second Thursday of the month) for guest speakers (frequently 2-Hours of Appraiser License CE credit) and lively discussion about current issues affecting the real estate appraisal industry and of course the best buffet lunch in Beaverton at Ernesto's just east of Jesuit High School. Live 2-Hours CE for Appraisers! After delivering an appraisal to a client they often have additional questions, unfortunately not all of these questions are legitimate or proper for the appraiser to answer. This short class will outline eight (8) common questions and provide information that will help solve the client’s needs, while keeping the appraiser safe and compliant with USPAP. · Can you simply change the effective appraisal date after delivery of a report? · Since the buyer/seller changed the purchase price can you simply change information on the delivered appraisal? · Can the appraiser “retype” the appraisal into a different client’s name? · Was the house or component X built to code? · If the house is destroyed can it be rebuilt? · Can’t the appraiser simply use “cost to cure” when determining a new value for an unfinished home? · The comparable’s house is gone can’t I still use it as a house comp? · Does an appraisal have to use bracketing? 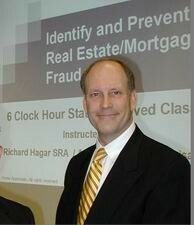 Richard Hagar, SRA, is an industry veteran with over 40 years of experience in real estate. A successful real estate investor, agent, and appraiser, Richard is also a passionate educator who enjoys passing on his knowledge and helping others to succeed. He holds the SRA designation, awarded to only the top 2 percentile of all appraisers in North America, regularly teaches courses at North Seattle Community College as well as at other private institutions, and has been instrumental in the creation of the State of Washington’s “Mortgage Brokers Practices Act” and licensing of AMCs. Richard's teaching method is loaded with real World examples. For some, it can be an "eye-opening" event. It's fun, and fast paced! Buffet Lunch begins at 11:30 AM. 2-Hour CE Program begins at 12:15 PM. Our site is intended to be of benefit to both users of appraisal services and our members. Our goal is to provide information about the highest quality of real estate appraisal services available to the public.